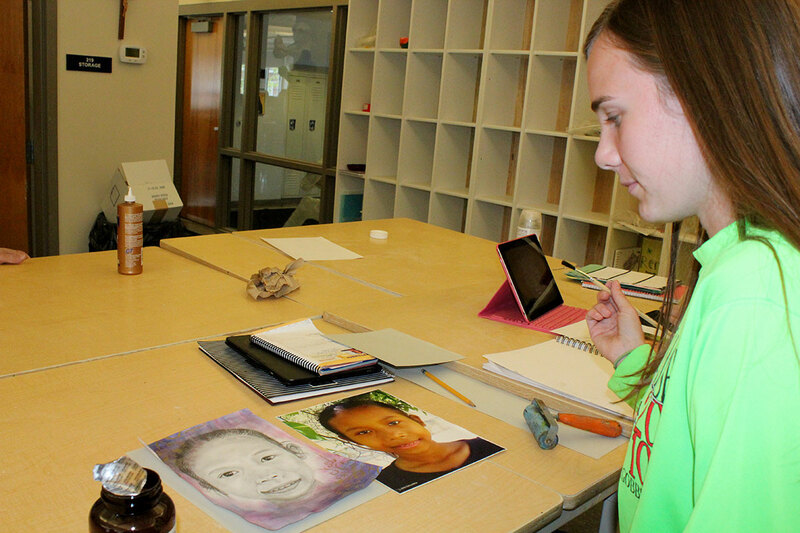 BROWNSBURG—Sometimes, simple ideas develop into grand projects. And sometimes, the result of such projects have a tremendous impact on others. It all started late last summer after a youth lock-in held at the parish. Anna and two of her St. Malachy friends and youth group peers, Brooke Dixon and Olivia Brown, designed the retreat. DeLucenay guided and advised them. To set the tone for the retreat, one of the first activities was eucharistic adoration. “That was the favorite part of the retreat for many of them, having that time to pray in front of the Blessed Sacrament,” says DeLucenay. It was also a means of evangelization. With several of the participants being from other Christian churches, the prayer time was preceded by a talk explaining Catholic teaching on the Eucharist and the practice of adoration, followed by time for adult leaders to answer questions on the faith. Even the discussions, by focusing on a godly woman who exemplifies the topic, offered evangelization moments. Appropriate to the theme of the retreat, the first talk focused on self-worth and dignity, with St. Perpetua serving as the example. The third talk dealt with authentic friendships, which DeLucenay describes as “wanting what is best for the other, encouraging, more than being a friendship of utility.” The relationship between the biblical women Ruth and Naomi was used to illustrate authentic friendship. In addition to saints and women in the Bible, activities helped reinforce the message of each talk. An “affirmation” activity after the second talk proved particularly meaningful to many of the girls. 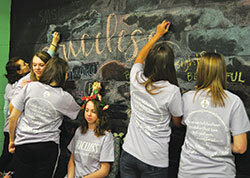 One at a time, each girl sat in a chair with her back to a chalk-paint wall, where the other participants and even adult leaders wrote affirming messages about the one seated. “To turn around after everyone had written all their words and to see what others wrote and see how others felt about [you], it was just like your time to accept all this love,” says Audrey Harrison, a member of St. Malachy and a sophomore at BHS. Fellow parishioner Julia Diagostino, an eighth-grader at Tri-West Middle School in Lizton, agreed. “It was really inspiring to see how everyone can build each other up just with a few words,” she says. Carter Davis, a senior at BHS and a member of Eagle Church in Zionsville, Ind., appreciates something she physically walked away with—each girl had a bag into which participants dropped notes with encouraging messages. Of all the talks and activities, Audrey Braughn’s favorite part of the retreat was adoration. The retreat was needed as well—something all of the girls agreed on. “It was a great way to escape all of our struggles and realize that God is the center of our lives, and that he will take all of our struggles for us,” says Rachel Barnes, a senior at BHS who worships with her family at Our Lady of the Most Holy Rosary Parish in Indianapolis. DeLucenay says the “Priceless” retreat was such a success that she hopes to work with teens to offer another retreat for girls next year, and one for boys as well. “It’s so powerful to see that the youth want to be engaged in their faith and have that personal relationship, and hopefully become more active,” she says. Olivia looks forward to helping develop the next retreat. Meanwhile, she reflects on the value of the “Priceless” experience.